I’ve written many in-depth reviews over the years. 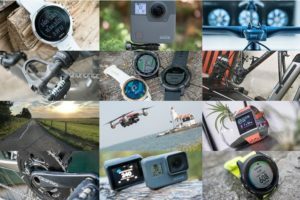 Trainers, GPS watches, action cams, drones…and yes, even a blender once (I still have the blender, it’s awesome). But, never a fan. But there’s a first time for everything, and today is that day. A review of a fan. And to be more precise, a really expensive fan. But, a fan that’s connected via ANT+, Bluetooth Smart, home automation tie-ins (soon), and even the good ole fashioned power button. All while blowing a super precise stream of air at exactly your body and nothing more. Given this is a new category for me, I’m going to do my best to redefine it. Which essentially means I’m going to try and keep it nice and tidy. I mean, obviously I’ll have to buy a fancy smoke machine and compare things at the hardware store. Plus I bought like 5 gallons of fake smoke. But those are all baseline for any sort of fan in-depth review. 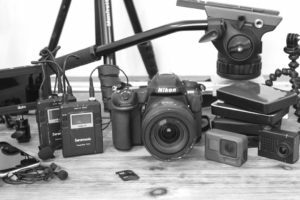 In the case of the Wahoo Headwind, they sent over a media loaner unit to blow…err…try. So, that I did. In fact, it’s even been with us here at the DCR Eurobike RV to keep things cool. It does a really good job at circulating air, as the air very much does not. After we’re done with it here moving hot air around the RV, I’ll ship it back to Wahoo like everything else I do. If you found this review useful, hit up the links at the bottom to help support the site here. Even if it’s just buying a smoke machine. 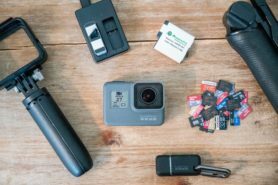 With that – onto the complete in-depth review! This may be the most simplistic unboxing I’ve done to date. Above, you can see the box. It’s pretty enough. More or less a standard designed box from Wahoo. In my case, the manual wasn’t inside the box since I expect it wasn’t ready yet when the boxes left the factory. Don’t worry, you don’t really need one – especially after you read this post. Thus my unboxing section is complete. Keeping in mind this is ‘only a fan’ (even if a really nifty one), I’m going to try and keep things as quick and straightforward as possible. ‘Try’, being the operative word. First up, let’s talk hardware. The fan has two air inlets on either side. This is actually an interesting advantage for small trainer rooms. It allows you to set the fan right up against a wall facing you, because the air comes from the sides rather than from behind the fan. Next, the fan has two small legs that can be pulled out of the back These legs act as a bit of a prop to lift the back and make the fan level. This is ideal if you put it on a table rather than the ground. Whereas when placed on the ground the fan will naturally point up at you in terms of the air channel. Which is actually super interesting. The Fan doesn’t have much bleed of air beyond a very narrow channel. The air is entirely funneled at a width roughly equivalent to that of your handlebars. You can see/hear this in my video where I can easily step into/out of the air stream by just shifting my body a little bit. 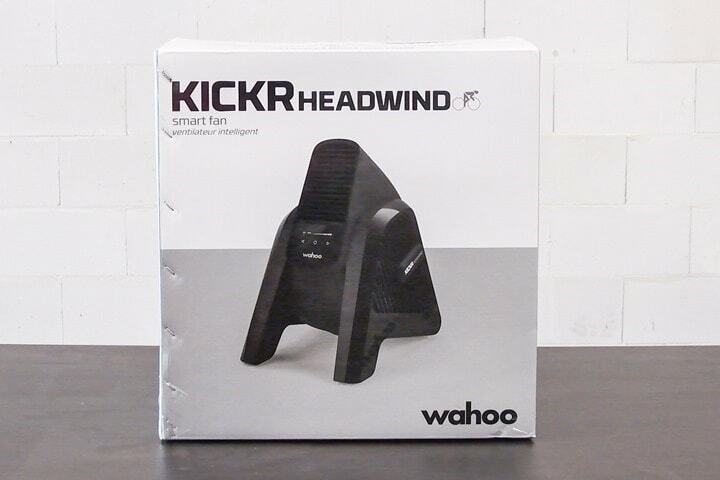 The fan has a small cutout to rest atop the Wahoo KICKR Desk, so when you push the KICKR desk around, this will go for a ride as well. The only downside to this is that using it with the KICKR Desk means that you really only get supreme crotch ventilation. That’s because the desk blocks the airflow to your chest and head. Thus while I do appreciate having my crotch well ventilated, I generally prefer airflow higher up on my person. 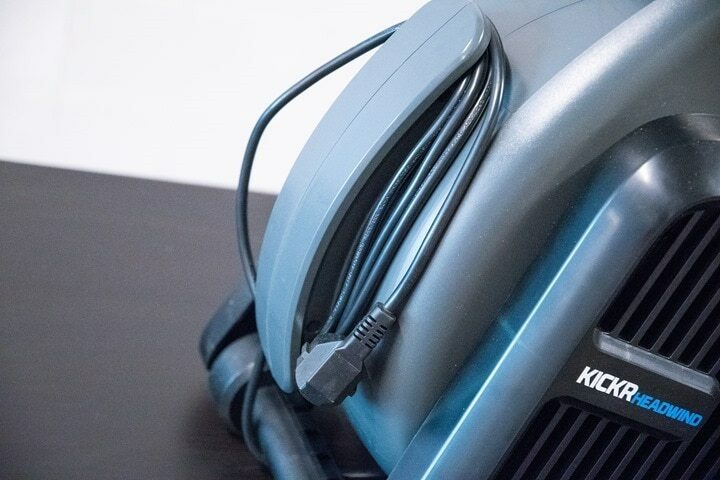 So for that reason I’d recommend placing your fan off to the side of the KICKR Desk instead. This works perfectly and you still get the full blowing force of the fan without the crotch concentration. On the fan is the power cord. It’s got a nifty vacuum-cleaner style cord wrapper, which I rather appreciate. Kinda logical actually. Looking at each of the options individually, first is the manual control pad on the front of the fan. This has buttons for powering it on as well as increasing the fan speed in four steps. Also, it allows you to change it to HR/Speed mode. All that works fine and dandy. Really, it’s just buttons. They do their thing. More interesting is the pairing pieces though. When you switch over to either of the two sensor control modes the fan will start doing a proximity pairing to the nearest heart rate or trainer sensor (depending on which mode you’re in). Thus you can essentially tap your heart rate strap to it, or bring your fan close to your trainer to ensure it connects to the right one. Or, if there’s only one sensor of those types around, it’ll find it by itself. When it does so it’ll stop blinking the blue light and show it as paired. This does NOT require any Wahoo sensors. It works with any ANT+ heart rate strap, any ANT+ speed sensor, or any ANT+ FE-C trainer. Why not BLE sensors? Well, that channel is reserved for the headwind to talk to your phone. Then you might ask, why not multichannel? The answer there: Soon. 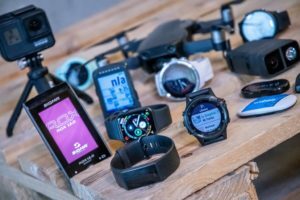 Wahoo will be the very first fitness company to flippin’ finally implement the ability to multi-channel BLE sensors so that it can concurrently connect to Bluetooth Smart HR sensors and your phone (since it’s the lower power side). Even more, Wahoo will soon be adding that to their other products (it’s unclear if that’ll be on new hardware or older hardware). Either way, that’s awesome news for consumers. Once you’ve got it paired you can specify the min/max values within the Wahoo Fitness app. It’ll do a simple 0% to 100% spread based on those values. You’ve got one set of values for HR, and one for speed. You can only select to be in one mode or the other at any one point in time, but it’ll save the settings for whichever mode you’re in. All of this works quite well enough, though, Wahoo gave me a small tip which I’d echo: Don’t set your actual max HR value here. Meaning, let’s say your max HR value is 185BPM. If you set that as your max HR value, you’ll never get 100% fan speed, even if you’re still dying at 170BPM up Alpe du Zwift. Instead, set the max fan HR speed for whatever point you actually want it to be. In my case, I’d put that towards the edge of Z2/Z3 HR. Meanwhile, the idea behind the speed/trainer pairing is that you can replicate going faster into a headwind (get it? ), by pairing it to the speed of the trainer. As you go down a hill you’ll feel the wind in your face (or crotch), and vice-versa going uphill. Of course, most of us work harder going uphill, so most of us want that cooling there instead – real world realities be damned. Next, that app also allows you to control the fan speed without any sensors at all by just using the little slider to set a specific value. This is actually the mode I’ve used most. Simple and effective. And finally, as seen above, the app allows you to update the firmware as well. Because, of course, your fan has firmware. Note that while the unit has planned HomeKit functionality, it’s not quite ready to be released (the actual fan itself will however be released this week and then firmware later will enable HomeKit). I’ll put an addendum in this post later down the road on the HomeKit bits once it’s ready. While some units will ship this week, the vast majority will go out in a few weeks starting in August. There’s really not much more to say about the Headwind – frankly it works perfectly. The app reconnects exactly as expected each time I come near it to start riding, and it responds without issue. From a technology standpoint, Wahoo has nailed this. 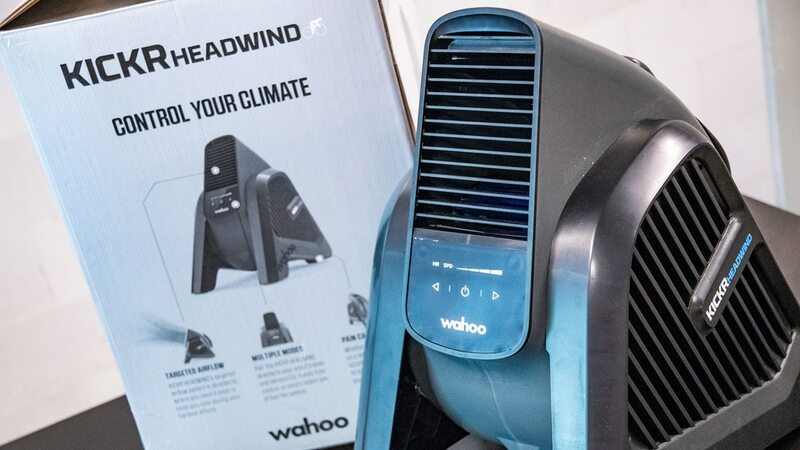 That’s not super surprising from Wahoo, but it’s worth noting that Wahoo actually partners with a company that has deep fan/cooling experience for the manufacturing of this. 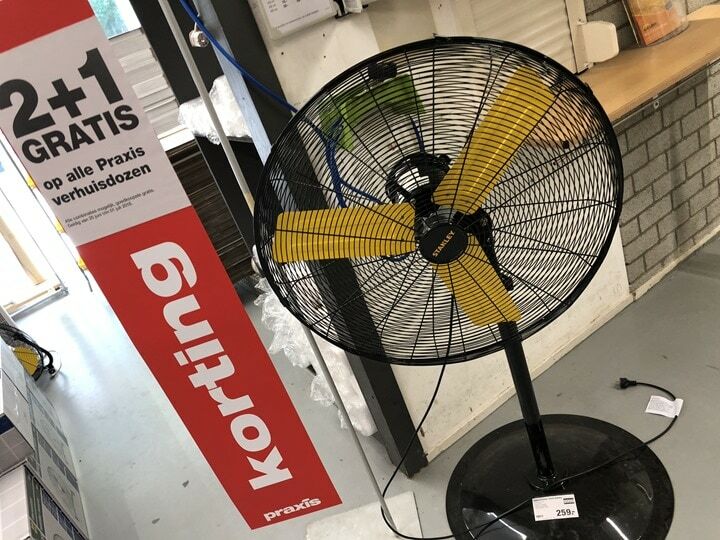 Thus with that manufacturer having many years in this space, that’ll hopefully reduce any hiccups that might come from a bike company trying to make a cooling device. Despite my substantial collection of trainers, I have a very minimal fan collection. I’m just not an experienced collector in that genre. The last time I bought a fan for my trainer was a decade ago (seen here). I got it at the end of summer in the clearance section at Target. It’s unlikely I paid more than tens of dollars for it. It’s lasted me until just a few weeks ago, when I tripped on a trainer and then fell onto the base and snapped the plastic frame that holds the metal legs. This was like the 3rd time I’ve done that, and this time I re-broke it in a bad way. Thus, in many ways, I’ve always been pretty happy with my fan – even though I had to use a transformer with it when I moved from the US to Europe, due to voltage differences. But given its untimely death, this got me thinking about fans. So I headed to the hardware store to see what one could buy for the same $250USD that the Wahoo Fan would cost. Well, actually, it’s 229EUR in Europe, so we’ll roughly use that instead. 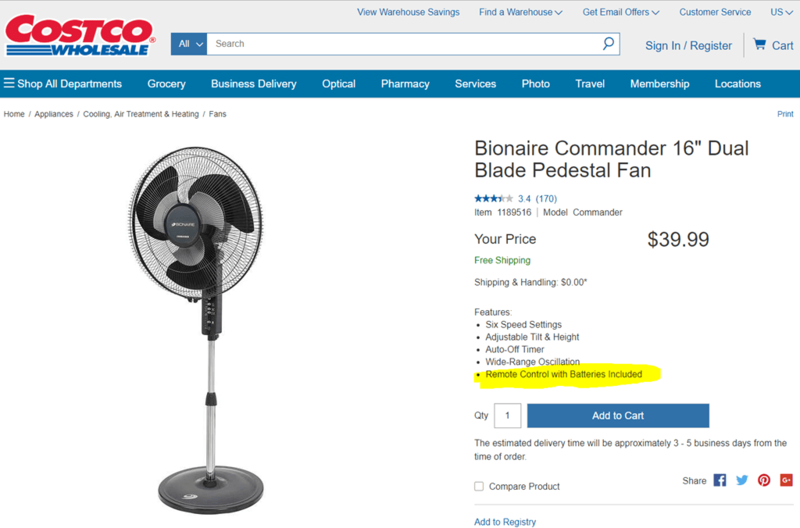 Or, I could get a crap-ton of fans for 20EUR-40EUR. Heck, there was even a buy 2 get one 1 free deal going. I could create an entire three-way fan setup. I could almost simulate cross-winds if I wanted to. And still do so for a fraction the cost. Want to make that fan smart? I could buy an Alexa and Google Home enabled power strip that I could individually control each of my massive fan array with for a mere $19USD. Note that in the above setup you can’t control the fan speed, so that is technically a point win for the Wahoo. But, on the flip side it has Alexa and Google support, which Wahoo lacks. But I could get even cheaper as a total setup. I could buy a $39 fan from Costco that includes a remote control and has six settings. This means I could just rubber band it to my bike and I’d be good to go – no need to mess with my phone (which, to be fair, with SIRI I don’t technically have to touch my phone either). Of course, there are a million options here. But I’m getting odd stares from people here in the Eurobike media center as to why I’m looking at the Costco and Amazon pages for fans. You get the point (as a side note, I’m actually excited about that power strip above. Going to find the Amazon EU version of it and have some fun…). On the flip side, people did this same sort of comparison to the Wahoo KICKR desk. They weren’t wrong, but they also weren’t right. In some ways I actually think the desk is a better value than the fan – because it’s far more specific to cycling than repurposing a hospital bedside table. And, I’ve yet to hear anyone who bought a Wahoo KICKR Desk be upset with their purchase. I love the one I bought – it just works perfectly. I do very much wish though it had power outlets/USB ports on it and wheel locks. But otherwise I’m good. And I suspect trying to compare fans here is kinda the same. There’s always a portion of the population that creates a DIY setup. 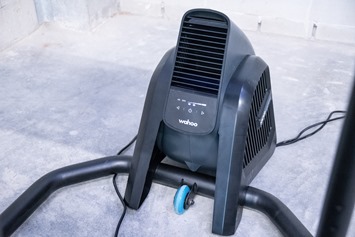 I could easily create the ‘ultimate pain cave’ bundle using all Wahoo stuff that would resonate well with certain folks, while I could do the same thing with nifty Amazon power strips and cheap fans that would resonate well with other folks. To each their own. If for a brief moment we set aside the price of the Headwind, the unit is well designed and well functioning. It fell off the table the other night down onto the ground and kept on ticking (well, fanning). And the app control of the fan speeds is indeed awesome for when you inevitably get on the trainer, start pedaling and then realize a few minutes later you forgot to turn the fan on. We’ve all been there. The point you decide whether or not to interrupt your visually perfect file on Zwift/TrainerRoad to get off the bike and hit that button or not. Not only that, but the integration to trainer speed and heart rate may appeal to some. I think that’s probably going to be one of those features you use once before you realize you just want the darn fan on all the time at a high level. Whereas the ability to change said levels remotely is useful, especially to have granular control when trying to balance volume against a TV show or such. For me, $250 is just super pricey for a…wait for it…fan. Had they priced it at $125, I think it’d sell far better, and I could swallow the price a bit more. To me that also seems like a fair price given everything it has going for it (since it would fit into the entire aesthetic design better than that Costco fan). Of course, as I said above – to each their own. If you get the fan, I have no doubt you’ll enjoy it (I liked using it too). But if you just buy that crazy power strip and four smaller fans…I suspect you’ll be pretty happy with that too. Whatever floats your boat. Hopefully you found this review useful. 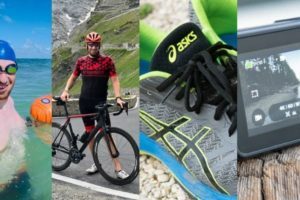 At the end of the day, I’m an athlete just like you looking for the most detail possible on a new purchase – so my review is written from the standpoint of how I used the device. The reviews generally take a lot of hours to put together, so it’s a fair bit of work (and labor of love). 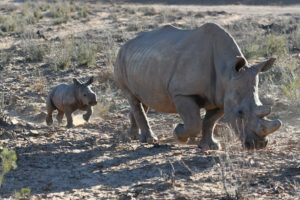 As you probably noticed by looking below, I also take the time to answer all the questions posted in the comments – and there’s quite a bit of detail in there as well. Additionally, you can also use Amazon to purchase the unit (though, no discount/points). Or, anything else you pickup on Amazon helps support the site as well (socks, laundry detergent, cowbells). If you’re outside the US, I’ve got links to all of the major individual country Amazon stores on the sidebar towards the top. I have a portable A/C and I’ll bet I could rig it to blow into the fan intake. But we just point in he A/C at me. Mmm…that’s a brilliantly tasty idea! What about cleaning? How do you clean the blades to get rid of the unavoidable dust build up? Not loud at low-levels (but those weren’t super strong). At higher volumes it’s reasonably loud (on par with other fans). What CFM does it …blow? The price would be more palatable if 500 cfm are coming my way vs a measly 20-30. OK 500 might be high but if 2-3 times the air is coming at me in a direct stream vs an 18″-24″ circular fan with a diffuse wind pattern, might have to put this on my list. This is what I want to know. 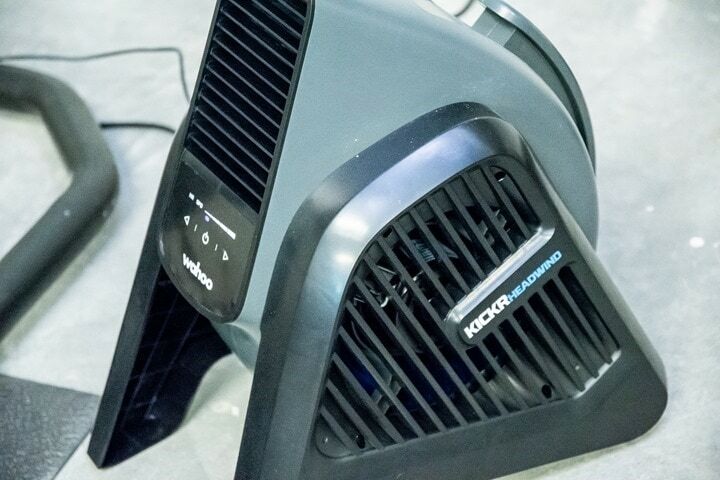 The Vornado 293 heavy duty large air circulator does 360-685 CFM and costs $125 at Home Depot. It has kept me plenty cool. It also has a shielded dust resistant motor for those that want to take it outside or in the garage. You nailed the price point at $125. If it were that I wouldn’t think twice about buying it, especially since it has phone control for adjustability. I actually do have an anemometer, and it was in fact sitting right next to the camera for this very video. Somehow in the entire shooting with smoke process I forgot to circle back to it. If you put the fan behind you do you go faster ? thanks for the eurobike coverage !! On a more serious note – I did spend over $100 on an industrial fan with remote control for my kickr and it was money well spent! What about the compatibility with a Taxc Neo 1? Yes, it is. Any ANT+ FE-C trainer, so basically any trainer made in the last 2-3 years except the CompuTrainer and Kinetic units. So I don’t understand is there a mode where do you get slower when you have the headwind blowing strong ? like you know replicating a headwind in cycling! 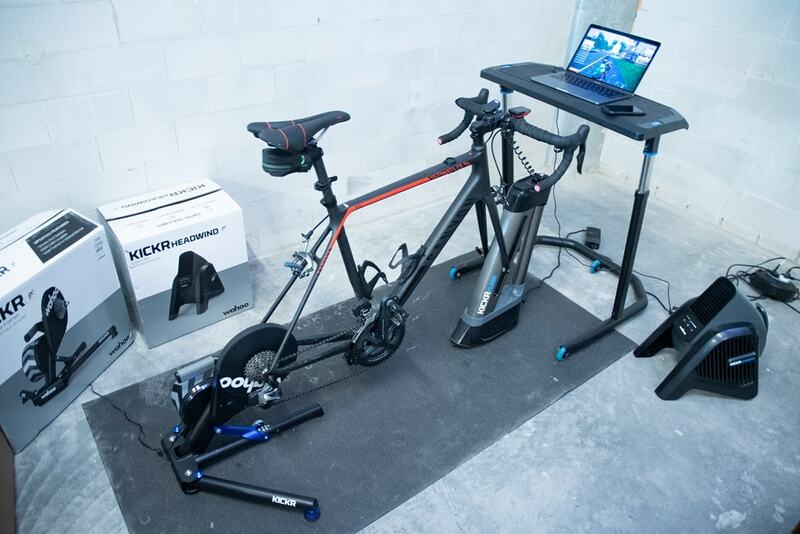 FEC trainer control based on wind speed… I love it!! Similar price as a Dyson Desk fan. I wonder what’s better. True and you’ll even get a remote control (not a smart feature but a better looking fan for sure). Indeed – I own 2 Dysons each more expensive as one Headwind unit. I will sell them all in the high season to be replaced with one Headwind. I also was looking at getting a variably controllable fan and recoding some of the code for that (and adding different actuators to activate it), but that’d be even MORE time and money. If I didn’t value my time at all, that fan would be likely 70-90 dollars to get equivalent airflow. Add in the Arduino and parts stuff and it’s definitely over $100 (probably over $150), but likely with lots more bugs, troubleshooting, and general jankiness. And if it goes wrong, I don’t have any customer service to call – just hours to spend myself scratching my head. I’m looking forward to more people joining in to compete on stuff like this and the CLIMB – both to lower the price but also to increase the features and immersiveness for the same price. 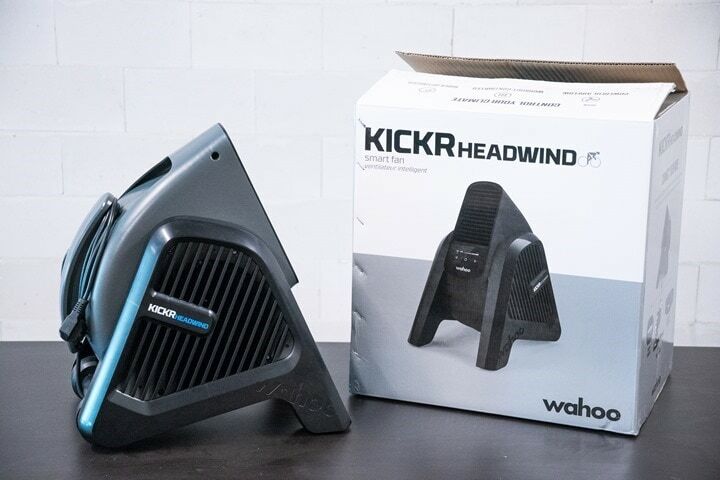 Also I think it was great for Wahoo to do the CORE – I was thinking about selling my KICKR 17 to a friend and upgrading to the 18 because last year I AGONIZED over silence vs CLIMB compatibility. But now that the CORE satisfies both so nicely… I think I might change my upgrade to the 18 to instead by a “downgrade” to the CORE and use the money for something like this or other misc. accessories. Thanks for the coverage Ray! Keep it up! Must be brutal trying to pump so much out… Good luck! They missed a feature which would make this worth money….. a water tank/humidifier. If they could put a evap cooler function into this, it’d be sweet to trigger cool air remotely. Maybe a dedicated remote control, so I hit it from my handlebars. However with this AND the remote strip I can plug a humidifier in and have it in the jet stream…. By the time I’m done my pain cave will cause the local power company to engage the nuke like Christmas vacation. The bike may be fine getting wet like that. The trainer? Yeah, I suspect the concern here would be moisture into electronics of the trainer. Actually I think this is the winner for me. Mounted to a ceiling joist and a pull chain for control it ticks all my boxes. I want more or less air just give the chain a pull or three. Same thing. I got this one blowing right to my face and torso. Has huge air flow all for 50 Canadian Pesos. For size perspective the monitor under it is 40″. And no I do not want it to reduce air flow depending on my speed if I am on a climb. I use this. Very compact, powerful and at $50 a lot more reasonable. Noise level? Some of those industrial style fans are very loud. Remote to adjust speed? I don’t want it set to one speed and have to get off the bike to pend over and adjust the speed. I do want to find of that isn’t too load with a remote as that Costco fan I have (the one in Ray’s post) only covers my upper body well so feel one that is aimed more at my legs could be very useful. I have this one too… works great. I just turn it on and go… I have the KICKR and the WAHOO Desk and this fits perfectly for 20% of the price.. I have this fan too. In addition to moving a lot of air without much motor noise it has two electrical sockets on the side. This makes it easier to plug in some other other devices nearby with less cords running around. Additional sockets is brilliant. And realistically Wahoo should have that too. By time I was done setting things up I had thick/clunky power cables for the Headwind, Climb, Kickr, plus for my tablet/PC. Can you tell us the Name of your fan? Am I the only one who thought: why would this thing need a power cord at all? Or did I miss this thought? Martin, generators and motors don’t have 100% efficiency. I guess you don’t want 40W worth of airflow when recovering or going downhill. Yes, I work in the electrical motors industry. Efficiencies are around 90% for motors and generators. So 80% in total. A normal fan like this one: link to a.co needs 60W. Wow – that price really is a killer. I added a wired dimmer switch outlet to my fans, which works well enough for now. I’d love to replace them with something nicer, but not for $250. Odd to tie it to speed too – why not power instead? Speed is basically meaningless on a trainer after all. Fan Doping. Just say NO! When it uses “speed,” is that trainer speed only? Or also Zwift speed? After all, trainer speed often doesn’t correspond with Zwift speed, especially when drafting or coasting down a hill. And then speaking of Zwift drafting… would it/will it change slightly when you start drafting? That’d be AWESOME. Finally, (and probably most importantly to all these features working well/being possible for outside parties to develop) – does it have variable control in automatic mode? In other words, when you put in your min and max heartrate, does it just pick 4 points from those because it only has 4 speeds due to hardware, or can it smoothly transition? Having 4 points in “manual mode” makes sense even if it’s capable of fully variable speeds, but it’s important to know if that’s a hardware limitation or whether it was just a UI choice for manual mode. That Costco fan is what I use with my kickr. Wish it was taller as I have to put it on a box but it has good air flow (min speed is a very light breeze up to a very strong air flow) and is very quiet. The remote is easy to use when sweaty. That is one major problem with the wahoo fan, I don’t see a smartphone as a good remote. I’ll have to switch out of the current app I’m in (xert workout or zwift companion) to get to it and if my hands are sweaty the screen may be hard to use during a workout. 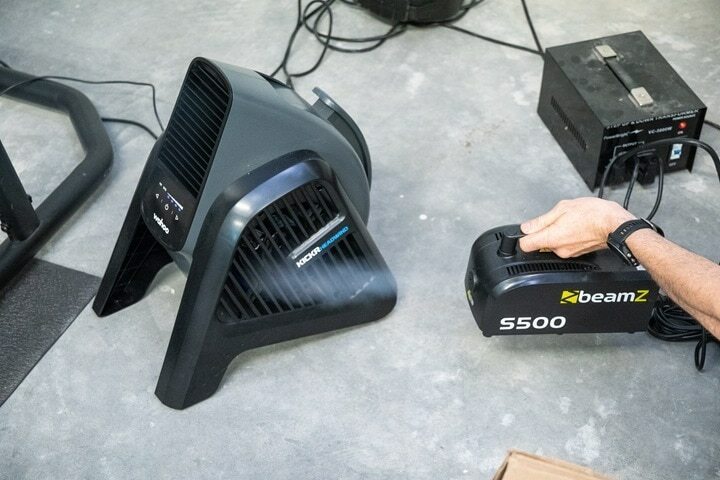 Why not support power to be able to adjust the airflow based on how hard you are working? HR may be better but if I’m not wearing a HR strap and the trainer is giving power data seems like it could be an easy fall back. Agreed all around. Should have an included remote. The CLIMB has one, so why not this? I mean in the suggested ultra-Wahoo setup where it sits on the back of the Wahoo desk, it’d be a pain to reach the buttons even if you weren’t riding your bike. Perhaps someone will develop a thing for power control? Wouldn’t work near as well on say a century ride where the effort/heartrate/sweat required for the same power goes way up as time drags on, but for most rides it’d probably be quite good. Really looking forward to all kinds of auto-control and neat things… we’ll see if it actually WINDS up with them or if it gets BLOWN off by developers. Bad jokes aside though, if it could change speed on Zwift to let you know you were drafting and other things like that, that’d be friggin awesome. Just FYI, you can control Headwind via your phone’s Wahoo app. So, your phone is the remote. It would be nice if Wahoo can do a firmware update for the Headwind that allows you to access the fan speed control from the lock screen on your IOS device (IPhone) without having to open the Wahoo fitness app every time to control the fan speed. I’m not interested in using heart rate to control it. Plus, when I’m on a climb on Zwift, with slow speed, then speed control doesn’t make sense, as I would want the fan speed to be higher on the climbs. Thus, I control it manually through the app. Come on Wahoo, make this happen! In a world of products looking for problems to solve this takes the cake. I have never forgotten to turn my fan on before a ride, and if it’s too windy before I am properly warmed up…Oh well, I’ll be cold for 2-3 minutes.The Horror! I agree. I am a big fan of Wahoo, but I was already wondering what had gotten into their head when they made the climb, now this? I use a fan that cost me $15 on amazon along with this handy remote link to amazon.com for another $10. Because sometimes when my garage is 5 degrees F when I get up to ride before work I really would rather not have the fan blowing until I get going. (As a side note, thank you to the TR podcast listener who wrote in to recommend that remote…fantastic $10 add on). I admit that Zwift does nothing for me, I am a Traineroad devotee through and through, so maybe I just don’t get it since my entertainment on the trainer consists of Netflix or pro racing. But $250 for a fan seems beyond the pale even for the bike industry…which, let’s be honest, it really saying something. I routinely forget to turn on my fan. So I bought a $19 fan with a remote. Problem solved. I didn’t even make it through the article before adding that power strip to my Amazon cart (with the DCR affiliate link, too! ).Super cheap for 4 voice-controllable outlets! Will work great with my Alexa setup, which I use for music while riding. Yeah, I stumbled on that this afternoon – totally buying it as well, just gotta find the Euro variant of it with some Amazon sleuthing tonight. I couldn’t find in the powerstrips description that it is HomeKit compatible. Just has the AppStore badge denoting that it has an app. I’d double check if you intend on using it with the full Home App Apple/Ecosystem. Very interesting. It shows it in the meta information for that search result. Will update accordingly. It was one of the most enjoyable video review I’ve experienced. Though; I see the fan’s future as very “smoky”. This strikes me as the answer to a question that has already been answered. To those complaining about the price, if you spend 10k on the bike 1.5k on the kicker, 500$ for shoes, 250$ for fan seems like super deal 🙂 Lets face it, it is not only fan, it is cool toy you want to impress all your friends with. They will not really be impressed with kicker since they have no clue what it is, but fan that kicks in when your HR goes up? Thats friggin awesome 😉 Lets have a beer now. This seems like the list expensive toys and at the same time quite useful. Friends don’t see my setup when using Zwift (or VirtuGo, Road Grand Tours, OneLap…). They can kinda hear it, though. As for any HR or control using power: You’d just set it to max to not care about another source of stressful thoughts, with the fan not blowing long enough after efforts or when you like it how you like it. Overall impression: eh, I’ll stick with my $50 pedestal fan. It’s nifty, but the price is… extravagant. Right. That’s the piece above I alluded to that Wahoo is going to address by implementing the multi-master spec that’s bee in Bluetooth since 4.2 many years ago that nobody has bothered to implement. They’re first going to do it within the fan side, and then down the road in the sensor side to address the issues noted. What if you in speed pairing mode enter speed values vice versa? So higher speed at first (value for “Min Fan Speed @”) and then lower speed (for “Max Fan Speed @”). Essentially, if you replace 5 and 10 mph to 10 and 5 mph from your example (image 14). In that case you should get 100% fan speed when you’re slower (when climbing and working harder) and less cooling when you’re cruising along faster throgh easier section when usually you don’t need much wind in your head/crotch. Is this working or does Wahoo Headwind go crazy? As mentioned previously wind speed doesn’t mean jack with regards to the fans primary function, cooling. It’s all about CFM and whole control via heart rate is nice core/skin temperature control would be better. For $250 it should have all the FUNCTIONAL bells and whistles. Pass. Edit- “While control via heart rate”, not “whole control via heart rate”. Wahoo is getting me the final CFM numbers. One thing I’d caution though is keep in mind when comparing CFM’s that the column of air does actually matter here. Meaning that the Headwind is a very narrow column of air specifically to hit a cyclist, but not really beyond your elbows (as I show in the video with the movement/mic bits). Whereas a traditional fan has a wider range that’s going to blow more air from a width standpoint. A bit of Apples to Pears sorta thing, food for thought that. What happened with the final CFM numbers? While the airflow may be targeted it would be nice to know CFM values for each of the four speeds. I already have the UK equivalent of the Cosco model, albeit circa $100 in UK its a very effective fan with remote. I will probably buy another one rather than was my money on this. Thanks for the review Ray. What is the UK equivalent? This is minor, but simplistic doesn’t mean really simple. It means overly or excessively simple, i.e. it entails a negative judgment. Thought you might appreciate the heads up! I get your crotch point, but I’d be bummed if I had an $$$ desk and added an $$$ fan and it couldn’t be placed directly in front of the trainer. 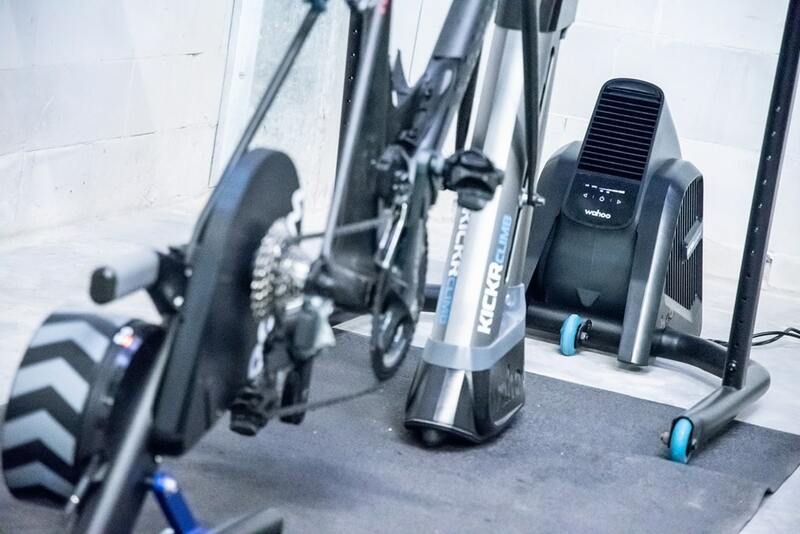 Based on your airflow photo it looks like there would be full coverage of legs, torso, and head if the unit were placed closer to the trainer, especially without the CLIMBR. It is odd that for $250 there is no ability to tilt it. Great to see the features they’ve included in the fan. I love to support innovation in cycling but I’ll definitely wait to see what the price is on Black Friday/Cyber Monday. The rumored silent KICKR will definitely get purchased much, much earlier. My constellation of Vornados controlled through home automation would be difficult to beat with one single fan. Vornado 540B clamped to the top of my HDTV provides glorious simulated headwind directly in my face. How are you controlling your fans with home automation? I currently use a Rowenta with remote control but it’s configuration is not ideal. I wish Vornado had a remote control option. It is likely my answer will not be particularly useful to you, sorry. I started my home automation deployment in 2010, and at that point in time I evaluated Insteon-based systems to be the best match for my specific needs. My system works well for me and the vendors involved are trying to keep pace with innovation in the market, but the minimum cost of entry may be a bit higher than other solutions. I’ve been involved with software engineering and associated technical fields for most of my life so customizing the system has been a nice hobby for those days I cannot ride. There is a Mac OS X based package from Perceptive Automation called Indigo that allows a Power Line Modem w/ RF capabilities to control and detect the status of various plug-in modules to control lighting, HVAC, and appliances. It has an internal web server that allows for self-created control pages to manipulate the devices along with a great wealth of other functionality. 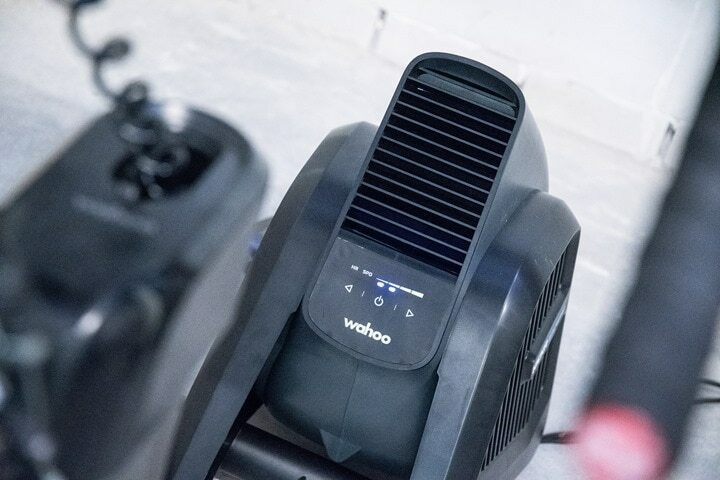 I have my system programmed to sense the change in power draw from my Wahoo KICKR when I start a training session and manipulate lighting & HVAC. In specific it starts one of three smaller Vornado fans and adjusts the temperature range at which my in-wall air conditioner will be turned off or on. Another two fans are manually controlled through a control page on my iPhone to fine tune cooling as my training session progresses. The Vornados seem to be good at projecting their air flow in a specific direction, so the three fans are pre-positioned to provide a low volume of flow on the legs, a medium volume on the core, and a high volume on the face. I attempted using some Oregon Scientific temperature sensors to control all of the Vornados automatically but ultimately found that feeling hot or cold wasn’t directly related to the actual temperature. Manually engaging the last two fans was less problematic. The home automation logic senses when the training session is over when the KICKR power draw ceases. 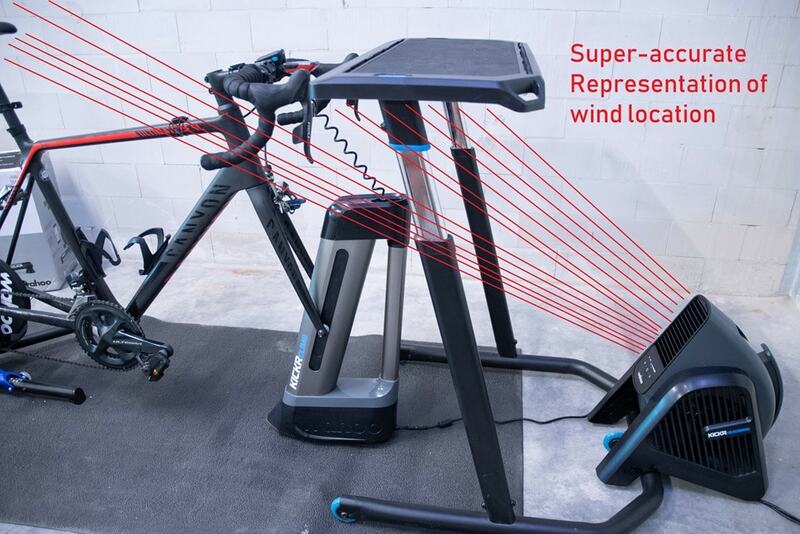 This triggers a web page on my primary computer to bring up Garmin Connect and runs the fans for ~hour after to dry the various pieces of cycling gear that are left behind. That is very cool and you’re right. A bit more than I’m likely to do but not beyond some possible tinkering. 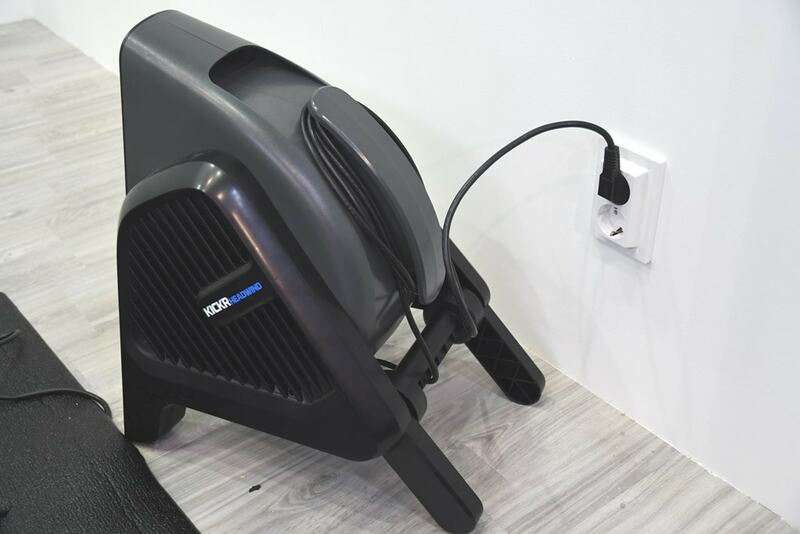 Anyone using a Vornado 623 or 630 with their trainer? Those models are highly rated on Amazon. Wes, do you have one of the portable A/C’s? How do you like it? I do. 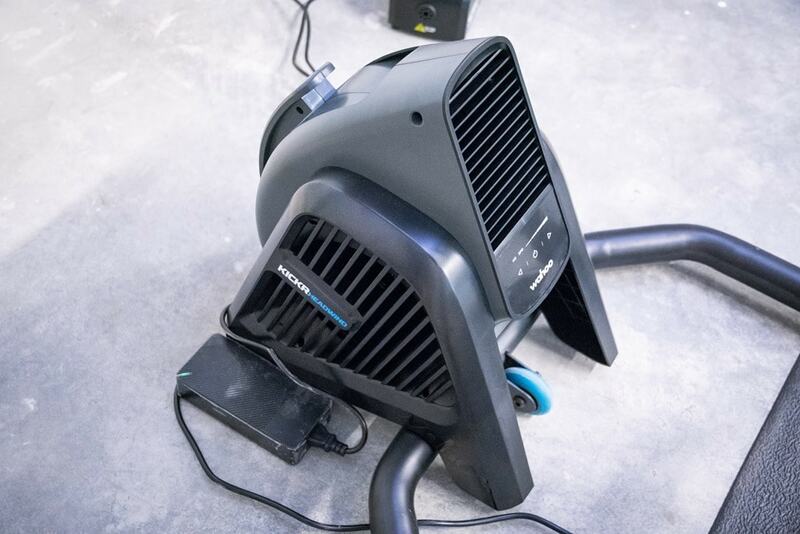 It works well in my gym bc I can have it blow in my direction (its too cold to have directly on me) and then have the vornado push the cooled air on my. Saves AC so I don’t have to freeze my wife out by running the entire house. Dyson AM07 has a decent rider spot on airflow too, but it is by far not as strong as the headwinds able to blast. The problem with this fan is that it does its job so damned well in a one stop solution you just have to fork out and buy it! I completely agree. I just set mine to HR synched to my Wahoo TICKR and off we go! 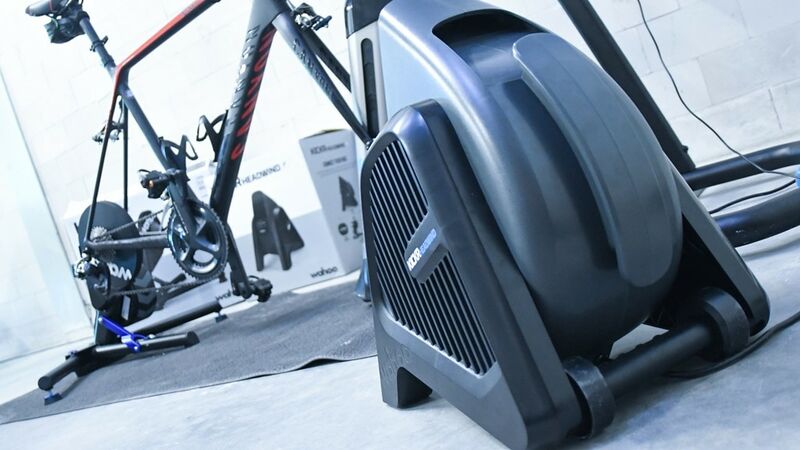 i’m a bit trigger happy with all things cool.. got a wattbike atom and was looking for a fan… this popped up.. then i think, hang on.. i have air con, just buy a massive fan and hey presto… £30…. wahoo clearly are trying to milk every ounce of cash they can…. Has anyone tried this with the Tacx bracket for tablets? Works fine for me with the Tacx bracket and iPad installed. Just need to carefully adjust the location of the fan relative to the bike. Will the Headwind fan work with any version of the KICKR ? I have a KICKR V2 (last version before the CLIMB compatible version). 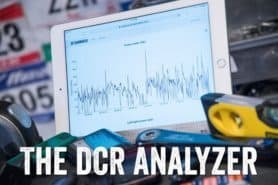 Are there any advantages to using the latest V4 KICKR ? Yup, in fact, it works with non-Wahoo trainers as well. It doesn’t discriminate. Hey , I‘am using the headwind also now . On the app my direto and the headwind are shown. I don‘t get my pulse in the app and the speed is over 300 km/h when my trainer shows 27 km/h. I tried to change the settings but nothing really changes. Do have an Idea what i can do that the right data will be displayed in the app? I have used your reviews/ instructions a couple of times, and they are terrific. Happy to contribute. Hi just received the fan and…Wow….I was amazed with the power…at it’s highest speed you almost need hear plugs,lol. I was gifted a headwind about 2 weeks ago. At first it was really quiet, but now it has developed a slight cavitation noise. Anyone else having this isssue? Wondering if I should take contact wahoo for a return. Ray – how do I have my Apple Watch HR pair with the Wind? I’m also experiencing the similar noise at low levels where it’s super silent to a weird hum. Unfortunately I’m not aware of any way to broadcast the Apple Watch’s HR out into open Bluetooth Smart HR profile. There are some apps that will display/connect to it, but that’s all via proprietary app connections and an Apple Watch app itself. My second update about the fan. Working like a charm, always use it paired with the heart rate sensor. Biggest drawback is the difficulty to position the fan in a way that you take the air blow. This is important if you have a front table or even a tablet holder in the handlebar. So far I am using a front table similar to wahoo (amazon 50€) and have glued rubber feet to the front of the fan so that I get most of the air blow around my face. I am a believer that 2nd generation will have better ajustability when positionend at ground level. I have finally bit the bullet and got one. Yes it’s expensive, but looks nice and fits well with my Wahoo desk. Also, I’m pleasantly surprised by the HR control, it’s a nice idea that is actually useful. Now if Wahoo made a magnetic trainer that is just as nice as the Neo, I would go 100% Wahoo since the Garmin plague has spread to Tacx. How do you position the desk/fan so that the airflow reach your upper body ? Anyone have issues where the TKCR doesn’t pair with the WIND? Sometimes it just works to NOT finding the heart rate signal. For being such an expensive trainer you’d think it would keep state after losing power. If the headwind was in the standby state when it loses power why can’t it return to that state when power is returned? When I warm up on the trainer the headwind is way too cold so I leave it off during the warm up and would like to turn it on after I warm up. I can’t just turn the power back on as it is in the off state when I do that. 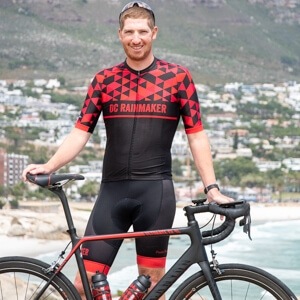 Launching wahoo fitness is both a pain in being an extra step and sometimes it causes the app that is paired to my kickr trainer to lose its connection so causes more problems. Anyone ever get a CFM number on this fan?